AdMob Is "Approaching A $100 Million" Revenue Run-Rate. Google Thinks It Can Be Billions. When Google CEO Eric Schmidt mentioned a few weeks ago that the M&A spigot is now back on at the search giant, he wasn’t talking about a trickle. Today’s announced deal to by mobile ad startup AdMob for $750 million is Google’s largest acquisition since its $3.1 billion purchase of DoubleClick in March, 2008, and its third-largest ever after the $1.65 billion YouTube acquisition in 2006. Why such a big bet? Because Google is gunning hard to dominate mobile Web advertising and AdMob has an early foothold in the display side. By focusing on the needs of mobile app developers, AdMob has “built what is approaching a $100 million business in three years,” says Jim Goetz, the partner at Sequoia Capital who sits on AdMob’s board, referring to the annualized revenue run-rate of the company. Since AdMob splits its revenues 60/40 with publishers, that implies AdMob is on course to see $40 million of that $100 million gross. The company is also cash-flow positive, with 140 employees. But it is more the growth potential of mobile advertising from here on out which attracted Google. “The rise of open mobile is something on everybody’s mind. I think it is the next battlefield,” ” says Richard Wong of Accel Partners, which is the other big investor behind AdMob. (The deal, combined with today’s sale of Playfish to Electronic Arts, gave Accel a $1 billion day in exits). Google is pushing for broader adoption of open mobile phones with Android, and is seeing a big jump in mobile searches across all Web phones. Even though search is expected to make up the majority of mobile ad revenues, Google needs to compete in mobile display ads as well. In fact, this deal is so important to Google that both Larry Page and Sergey Brin personally got involved to sweet talk AdMob founder Omar Hamoui, as you’d hope they would for such a large deal. “The personal entrepreneur-to-entrepreneur dynamic was critical,” says Goetz. AdMob already shares a lot in common with the Google culture. It splits network ad revenues with developers in a model similar to AdSense, and it focuses on the needs of mobile app developers to help put money in their pockets. The rise of the iPhone, and now Android, is creating more mobile apps and more mobile Web browsing, which in turn is creating more mobile ad inventory for AdMob to fill. In September, AdMob served up 10.2 billion ad requests across 15,000 mobile Web sites and apps. 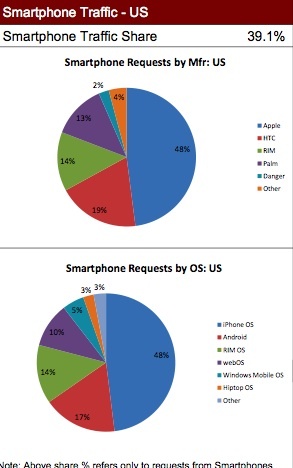 About 28 percent of those were from iPhones and iPod Touches, with Android growing fast, making up another 7 percent. And if you look at only smartphones, Apple devices accounted for 48 percent of ad requests, with Android coming in second at 17 percent. Now, just at the point that those mobile ads are taking off, Google is getting into the game. With AdMob, it is not buying gee-whiz technology or a popular consumer destination. It is very clearly buying a future source of revenues. And Google is in a unique position to accelerate AdMob’s revenue growth by plugging it into its existing AdWords and DoubleClick systems and exposing it to the hundreds of thousands of advertisers who already use Google and might like to add mobile display ads to their campaigns. AdMob’s current revenue run rate of $100 million is impressive, but Google’s purchase price tells us it thinks the opportunity for mobile display ads is in the billions of dollars, at the very least.